Chevy went a little tone deaf displaying the Mexican-built Blazer above a Detroit baseball stadium, FCA might find a friend at PSA, Toyota is stressed over trade, and so much more for The Morning Shift of Monday, April 1, 2019. General Motors has displayed its newest models around the center field fountain of Comerica Park, home of the Detroit Tigers baseball team, for the past 10 years. This year, it chose a pickup and the new Chevy Blazer, which then pissed a lot of people off. The problem is the Blazer is assembled in Mexico, and GM recently announced it was planning to close down its Detroit-Hamtramck assembly plant and its Lordstown Assembly in Warren, Ohio, among three other North American plants. ﻿Its choice of the Blazer, though, reignited anger over GM’s plant cutbacks. Union leaders have condemned the company for assembling the Blazer in Mexico while cutting jobs in Canada, Ohio and Michigan. 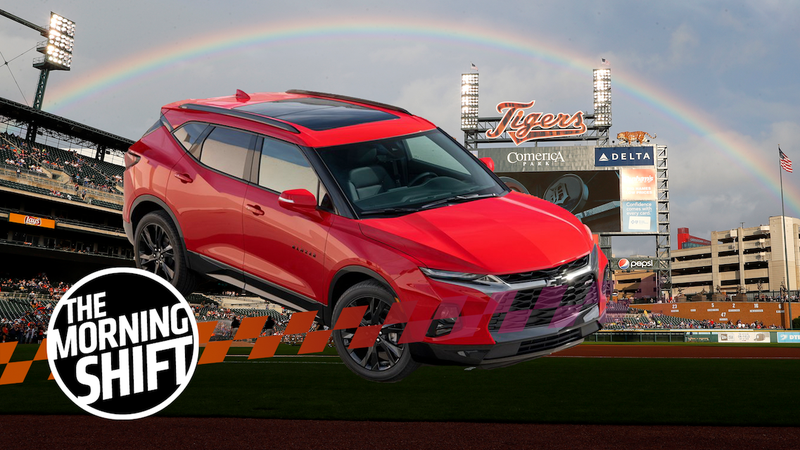 “We want people to enjoy baseball without distractions, so we are going to replace the Chevrolet Blazer with a Chevrolet Traverse at the Comerica Fountain,” said [GM Spokesperson Jim Cain] in a statement. It’s really hard to understand how GM didn’t see this one coming. While it does make sense initially to advertise your newest model, if there’s any crowd in America that would be aware your car isn’t built in the U.S., it’s the autoworkers sitting in the Detroit Tigers stadium. ﻿GM and FCA had a “legitimate” discussion about the plant, one source said, but couldn’t reach a deal for various reasons. The exact time frame and terms of the proposal are unknown. Two other sources said FCA’s proposal came after GM announced in late November that the 34-year-old Hamtramck plant wouldn’t be assigned a new product in 2019. GM’s cost-cutting move caused FCA to pause planning at its Mack Avenue engine plant site in Detroit to study the feasibility of building Jeep SUVs at Detroit-Hamtramck, the two sources said. While GM has planned for the cuts, it’s already extended production at the Detroit-Hamtramck plant into January 2020, and still has to negotiate with the UAW. It would be a lot easier, and better for those losing their jobs, if GM would work out a sale of the plant instead. Fiat Chrysler Automobiles has been looking for potential business partners for some time, but it seems they may finally have found a deal with PSA Group, the company behind Peugeot, Citroen, DS, Opel and Vauxhall. Former FCA CEO Sergio Marchionne championed the idea of an alliance or merger with another major automakers, infamously gunning for GM, believing that two companies could easily cut down costs by working together. It’s an idea that current CEO Mike Manley is also interested in, according to Auto News, and he may find a deal with PSA as it’s been looking for growth opportunities as well. “No single car manufacturer alone can afford the sheer size of investments needed to develop platforms for the kind of smart, hybrid and connected vehicles that will hit the road in coming years,” said Carlo Alberto Carnevale Maffe, a professor at Bocconi University in Milan. Carlos Tavares, CEO of PSA Group, has only confirmed that it was in beginning discussions with a specific partner, and still planned a U.S. comeback, in an article in the Wall Street Journal over the weekend. Such a deal could make a lot of sense, as PSA wants to grow globally and FCA looks to expand into Europe more effectively than it’s managed with Lancia and Chrysler in the past. But with FCA’s aging lineup and seemingly endless shift in future plans, we’ll have to wait and see what it can actually pull off. Toyota’s North America CEO Jim Lentz doesn’t seem to think that emerging trade talks between the U.S. and Japan are starting off particularly well, which he believes could spell serious trouble for the U.S. auto market. ﻿A still-polite but growing trade dispute between the U.S. and Japan — one with talk of 25 percent tariffs, volume-limiting quotas and faint echoes of jingoistic populist themes from three or four decades ago — threatens to “derail” an otherwise healthy U.S. auto market, Lentz says. If worse comes to worst, and the two longtime trading partners can’t find common ground, tariffs could knock down 2 million new-vehicle sales as quick as a Texas windstorm, he warned. If it starts to go down anything like the U.S. negotiations with China, it could get really ugly. The company’s dealers are expected to lobby Congress against the proposal of import tariffs on automotive parts next week, according to the report. While the current alliance between Reanult, Nissan and Mitsubishi is in a bit of a crisis with the indictment of former Nissan CEO and current Renault Chairman Carlos Ghosn, reports now indicate that there was pressure to solidify the alliance between the three companies in the months before Ghosn’s arrest, possibly by bringing in yet another company. In the correspondence, Saikawa raised the possibility of bringing in another automaker as a fourth partner for the alliance. He did not identify any potential candidate. He wrote that expansion opportunities also included “acquisition of Chinese companies” for electric vehicles or connected services. In the message to Ghosn, Saikawa advised changing the alliance’s structure in 2019 “rather than wait.” Seven months before, Ghosn had pledged to cement the partnership, a promise that came after France, Renault’s most powerful shareholder, had demanded deeper ties with Nissan. Yet a move for closer relations faced resistance from within Nissan, which feared Renault would gain even greater sway. Already their shareholding is lopsided, with Renault owning 43 percent of Nissan compared with the Japanese automaker’s 15 percent stake in Renault. Their partnership has been under further strain since Ghosn’s Nov. 19 arrest. So, if the reporting is accurate, Nissan was under pressure to gain more power in the alliance, but was also interested in a full-on merger with Renault. Renault was feeling pressure to advance the alliance into a full merger as a way of erasing that aspect of uncertainty for its future. Meanwhile, all of the companies were worried about the cost of developing all-new platforms for electrified vehicles, and the easiest approach for that could be finding a fourth company partner. According to the Financial Times via Auto News, Renault is still interested in making a merger with Nissan still happen, even amid the Ghosn scandal. The company reportedly plants to secure the merger, and then start courting other potential partners. Neutral: Do You Think FCA Is the Best Partner for PSA? Out of all of the American automakers, is there any company you would rather see PSA pen a deal with than FCA for its great American return? Alfa Romeo hasn’t been the bombshell success FCA wanted when it brought the brand back stateside, at least not yet, but can they do it right with Peugeot?